The Cuisinart CCO-50BKN electric can opener features single-touch operation which effortlessly opens any standard size can. The opener has chrome accents and elegant contours which fits in nicely with other modern countertop appliances. It has easily detachable power Cut® blade and strong magnetic lid holder for quick cleanup purpose. 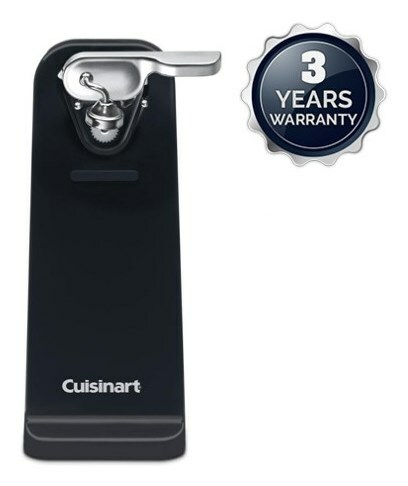 The Can Opener Black has many exciting features for users of all types. 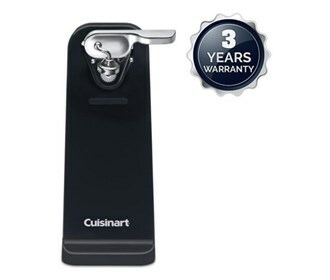 You can extend the lifetime of your Can Opener Black with the purchase of a FactoryOutletStore Factory Protection Plan. See the Can Opener Black gallery images above for more product views. The Can Opener Black is sold as a Brand New Unopened Item.